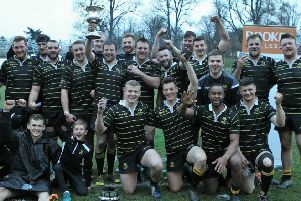 St Boswells RFC are pictured in celebratory mood after winning BT East League 1 last Saturday, defeating Forresters RFC 58-0. St Boswells – the Saints – have now won 51 continuous league matches spanning three seasons, winning BT East Leagues 2 and 3. The Saints now go marching on to National League 3. They were previously on a run of 59 matches, unbeaten in all competitions, but the winning run came to an end in the BT Shield semi- final against Carrick RFC, who went on to win the Shield Final by defeating Highland RFC.